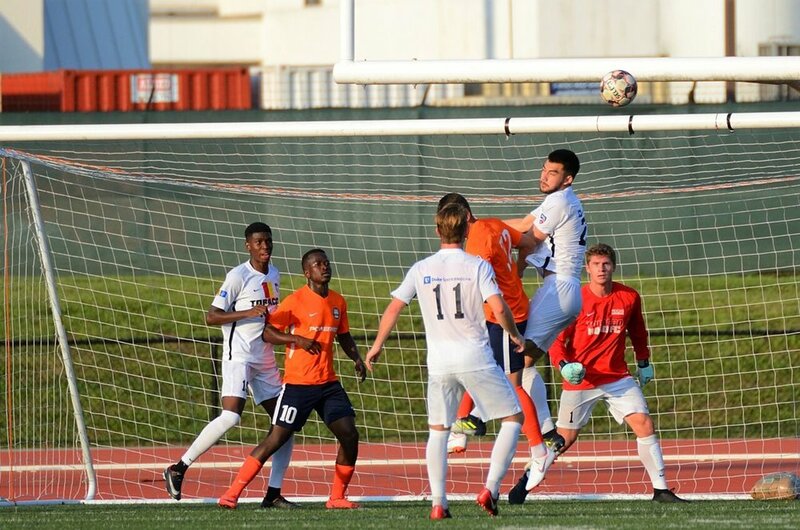 DURHAM, NC- Tobacco Road FC suffers its first loss of the season to the Premier Development League defending national champion Charlotte Eagles by a 2-1 margin on a hot Wednesday night at Durham County Memorial Stadium. From the first kick the match was back and forth early on. Tobacco Road pressured hard and found space on the outsides of the pitch due to its 3-5-2. The Eagles 4-5-1 formation allowed them to create more in the midfield. Charlotte controlled the beginning of the half, having a shot from striker Chris Brenna inside the box hit the post. Charlotte continued to put pressure on the Tobacco Road center-backs through the middle of the field. Tobacco Road found their legs about 10 minutes in. Forwards Taff Wadda and Eli Garner were relentless in creation. Garner played a through ball to Wadda who was fouled, giving Los Toros their first chance of the night. Five minutes later, Wadda curled a ball into the box to find Pineda who attempted a cheeky flick but it sailed over the bar. In the 24th minute the Eagles broke the stalemate. A cross sent into the box bounced around and ended up at the feet of Robinson Moshobone who placed it into the bottom left corner. Tobacco Road refused to drop their heads and kept their foot on the gas. They controlled most of the first half, with the majority of Charlotte’s attacks being counter attacks. At half-time, Tobacco Road found themselves down one to nil, but out-shot Charlotte eight to three. The first ten minutes of the second half beloged to Charlotte. They controlled the pace and created the better chances. Tobacco Road goalkeeper Ryan Cretens did well to not let his side concede another. A one-on-one save in the 50th minute was the biggest moment of Cretens night as he kept Tobacco Road in the match. In the 62nd minute Tobacco Road began to go to their bench. Tommasso D’Agostino made his 2018 debut for Los Toros and provided a spark in the attacking mid position. He combined well with Garner and Wadda to create chances. Mauricio Pineda leveled the match in the 76th minute. A ball that was sent into the box found Garner who chested it down right into the path of Pineda. Pineda hit a right-footed strike into the bottom left corner with no hesitation. Tobacco Road kept pushing as substitute Ben Fisher did well to come in and make an immediate impact. Fisher was all over the front line as he sent balls into the box from both sides of the field. In the 82nd minute, his best cross found Wadda in the box but Wadda’s shot was not strong enough to trouble the keeper. An Eagles counter attack in the 87th minute was the difference between the two sides. A long cross to the near touchline found Derick Gonzalez who miraculously kept the ball inbounds although many Tobacco Road players thought the ball was out and slowed down. Gonzalez continued down the pitch to slide the ball across the six-yard box and find Danilo de Silva to put it home. A commotion incurred from the Tobacco Road bench questioning whether the ball was out of bounds, but ultimately the result stood. Los Toros will be looking for a rematch when the two teams meet again on June 27th in Charlotte. Tobacco Road FC next takes the pitch against the reigning division champions as they travel to Myrtle Beach to go up against the Myrtle Beach Mutiny on Wednesday. Follow @TobaccoRoadFC on twitter for live tweets from the match and information on how to access the live stream.